Temple of Abydos, Egypt. Dynasty XIX, 1317 B.C. The vulture Goddess Nekhbet was originally worshipped in the city of Nekhbet but later she became a national Goddess representing Upper Egypt in the same way that Lower Egypt was represented by the protective snake Goddess, Edjo of Buto. The animals of the two Goddesses became the symbolic animals of the two halves of the country. The vulture and the snake became the royal insignia, especially as adornments for the head, in fact, they became embodiment of the two crowns. 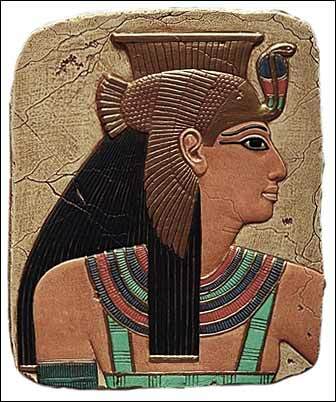 Nekhbet is often shown with her wings outstretched in protection, often hovering over the Pharaoh and holding in her claws the hieroglyphic symbol the �Shem�, which means �to encircle� and �infinity�, and represents lordship over all that the sun encircles. Nekhbet was also considered a Goddess of childbirth, often shown suckling the royal child or even the King himself. Here Nekhbet is depicted in the guise of an elegant Queen.